Open to singers and players of any and all instruments. Using well-known songs from folk, blues, swing, and Caribbean styles, we’ll develop unique ensemble arrangements by changing up rhythm, groove, timing, and tempo. In the process, we’ll learn how to collaborate musically, proving that the sum is greater than its parts. Bring your skills and talents, and be prepared to participate in the creative process. Barry Truter lives in Vancouver, BC, and has been a traveller for much of his life. His music and songwriting are influenced by the places he has lived and worked including India, Fiji, USA, England, Canada, and a spell at sea working on a tramp freighter. 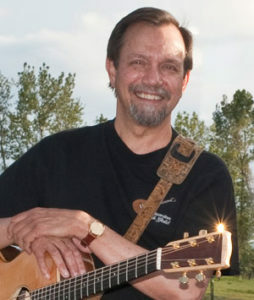 Barry is a co-founder of the Georgia Strait Guitar Workshop (GSGW). He teaches guitar privately, and for music institutions in the Pacific Northwest including GSGW, Rossland Acoustic Music Camp, Puget Sound Guitar Workshop, Vancouver Island Music Workshop, and Vancouver’s Moveable Music School. He performs solo, and with folk group Fraser Union, and blues duo Jook Joint Jokers.